The Smokehouse is a design concept for a tobacco shop in downtown Seattle. The design concept is based on a play on words. Cigarette users often call their cigarettes “smokes”. A “smoke” house would be a place one would go to purchase “smokes”. Of course a Smokehouse is a place for making smoked meat. Smoking of tobacco began with the Native Americans. Seattle is known for its smoked salmon. The design concept built on these ideas using imagery based on tobacco history and fish smoking. At the front of the store are a couple traditional cigar shop Indians. The colors throughout the space fall in the range of aged tobacco leaves. The floor is plank style, like a building on a wharf where freshly caught salmon is brought in to be smoked, or at the floor of the shop next to an old salmon smoker. The brown color range also represents smoke from the salmon smoker. Major Considerations: The budget was very limited, so the design depends on color and inexpensive materials for appeal. The merchandise includes fine cigars and bulk tobacco in humidors, as well as some smoking pipes. The brown color range harmonizes with the colors of the merchandise. The flooring is a very convincing plank style vinyl. 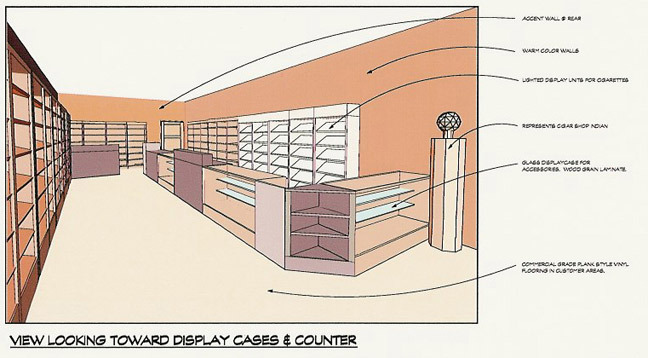 The casework includes some stock store fixtures, unobtrusively worked into the design with the custom casework. The overall layout is designed so it can be operated by one or two people, and to provide security.